Newsflash: Searcher dies of old age waiting for “the next Google”! The “next Google” is coming, but it isn’t what you think. And if you are waiting for what you think is coming, you are not going to see it, ever! I wrote a post recently about the current buzz with declining search results quality. I followed that with a post on what I thought were big problems with search that have still not been addressed. With all this, we can certainly agree that we have some pressing current issues with search, and many unsolved problems as well as untapped opportunities as well. Who’s going to solve all these search problems? The vast amount of discussion about search is so myopically centered around Google, as the sole tool and the savior of humanity for all its search needs, as current social attention on it shows. The blue line is buzz about Google. 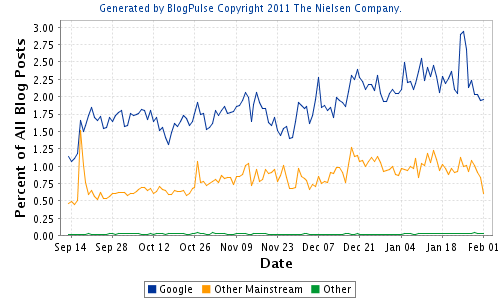 The orange line is buzz / discussion on Bing, Yahoo and all other mainstream engines like Ask, AOL etc. That little green line at the bottom of the graph above is the rather miniscule amount of buzz on any manner of other search tools other than Google and its mainstream cousins (including but not limited to all new / alternative search engines, specialized search tools, specialized databases, and much more). This is how dominant our discourse is about Google and the other mainstream engines. This is particularly absurd and illogical as I see it! Let me explain what I mean with this personal example and analogy. I am not a handy person and usually call upon a handyman to fix problems in our home whether they are electrical, plumbing, or other issues. The handyman comes with an array of common tools into my home, and often when he doesn’t have a tool in his tool belt to solve a specific problem, he steps out to his vehicle and comes back with a more specialized tool or set of tools to get the job done. How absurd would it be to imagine a world where the handyman has just one tool or a couple of tools in his tool belt and that’s it! How would he fix all my varied fixit needs? It is by having a wide range of relevant tools that the Handyman steps into my home and is able to deal with the wide range of fixit needs I have. So, why do we really look only to Google to solve all our varied search problems? Or when that doesn’t happen, seek a “better Google”, which is just as nutty? Wouldn’t we be better serving ourselves by recognizing that we are trying to get one tool or a few tools from one company (or another) to solve all our past, present and future search problems? Shouldn’t we be thinking about using the best search tools for different search jobs? And then talking about our search toolset and educating others to think likewise? My personal search approach uses Google as the default while using other sites for specialty searches. On Bing, image search is far superior and Wikipedia for 101 style information. Using a toolset of search engines and search tools just makes more sense. Wouldn’t that be the right way to break free from the Google euphoria, and the Google addiction on the one hand and the Google disappointments and the Google disillusionment and the continuous hankering after the next Google or a Google-killer on the other! As I see it, the “next Google” isn’t a single search engine replacement for the world’s #1 tool of choice. It is a search toolset that is going to be as vibrant and as varied as what the world has embraced with the diversity of tools and applications on their mobile devices. The sooner we usher in that mentality into our personal search practice, the sooner we are going to be part of the revolution that is coming ahead. If you are a reader of this blog, you must have noted that I have a stake in this future. My startup, Zakta, has created a specialized search tool for your toolset called SearchTeam, a real-time collaborative search engine . It is perfect for all those times you have to search the Web with friends, classmates and colleagues, or just when you need research the Web deeper and more efficiently. It doesn’t aspire to be the next Google, but be a highly desired part of the search toolset that will be the “next Google”. No! No one has died yet waiting for “the next Google”. But they could, if they remain myopically anticipating a Google revival and return to the glory days of Google as the sole king of search, OR if they remain waiting for the Google-killer which will come and deliver them from all their search problems! That isn’t happening, as far as I can see it. But this is all just my opinion.